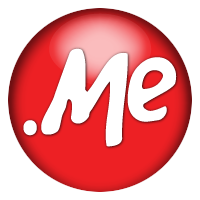 .me is a country code top-level domain (ccTLD) for Montenegro located on the southwest of Yugoslavia. However, because .me is very easy to understand and remember, it is widely used. The websites with .me often include diverse and more original content. The two characters of .me contain unlimited potentials, and it also offers an easy way for enterprises to promote themselves faster and more effectively. That's why it is highly popular among various platforms, such as ele.me and fb.me. With this domain, it seems that you add a ".me" behind your customers' name, as a personalized gift for them as well. .me domain offers a better platform to show you. .me symbols you and enables you to display your personal image, so it is suitable for personal websites. For individuals, .me is certainly the best domain option to highlight your charm of the "id". .me fits all companies, organizations, and individual, having wide uses and being recordable.